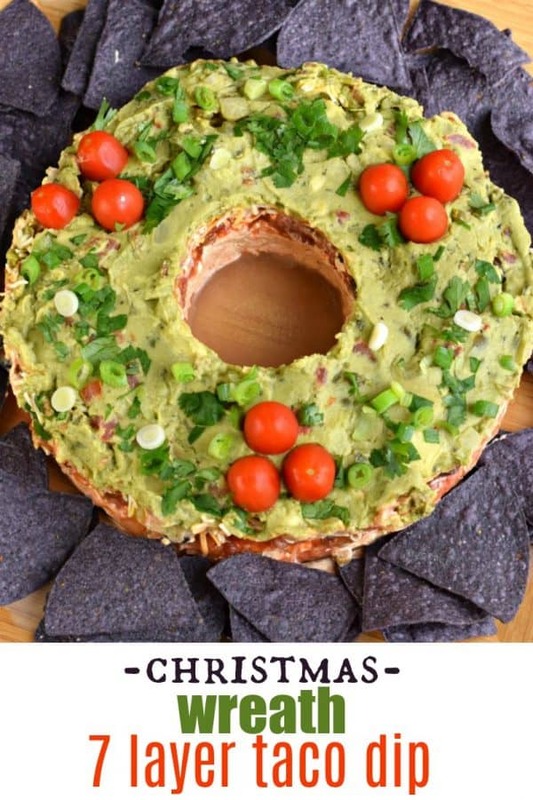 Quick and easy Festive Christmas Wreath Layered Taco Dip Recipe is the perfect holiday appetizer. 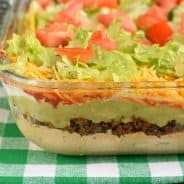 Add the festive holiday touches, or serve it in a trifle for a true 7 layer taco dip experience! My obsession with taco dip recipes is real you guys. Remember in October when I shared this super fun 7 layer taco dip? You guys went bananas. So many of you shared your own creations and tagged me on instagram (you can do this by tagging my page or using #shugarysweets). 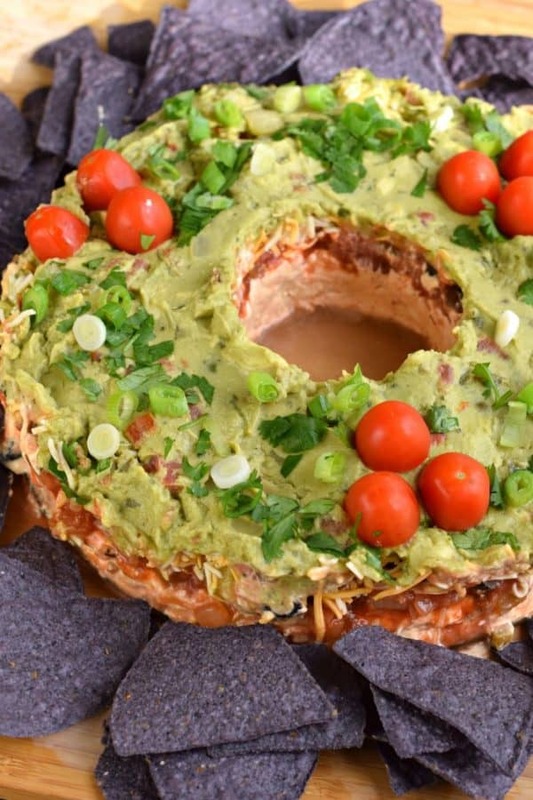 It got me thinking…it all actually started with this Wreath Layered Taco Dip. I saw this shared on facebook and I made it last Christmas. HUGE hit. So then this fall I made the Halloween inspired dip. But then it occurred to me, you guys, I still hadn’t shared today’s version. So, for the most part, today’s taco dip recipe is basically similar to the one in October, with a few changes. First, I skipped the ground beef. While I love the flavor it adds, I chose to not use it. You could add it back in if you prefer. I also skipped the refried beans (which was optional in the last recipe). 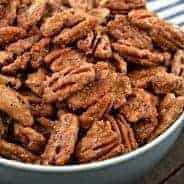 I personally am not a fan, but last Christmas when I originally made this recipe I used refried black beans as the base and it was a huge hit. You decide. The other difference is that it’s not made in a pie plate. Instead you will use a springform pan. More details below! Start by wrapping a small glass or can in foil. Press the foil so it’s nearly smooth all the way around (that way dip doesn’t get caught in the crinkles). Prepare your 9 inch springform pan by attaching the bottom plate, then place the can in the center. This will create the open center of the wreath. Begin adding layers. You can customize all the layers to your own taste buds! Layer 1: In a medium bowl, blend together cream cheese, sour cream, and taco seasoning mix until smooth. Spread this in the bottom of your pan. (You could also substitute plain greek yogurt for the sour cream). Layer 2: Add your favorite salsa. Thick and chunky works best. 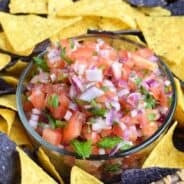 My homemade pico de gallo is a great option, but any salsa will work (less watery the better though). Layer 3: Spread a can of diced or chopped green chilies over the salsa. You could also use chopped jalapenos too for a little more heat. Layer 4: Black olives. I chose a can of sliced olives, but diced would work well too. Layer 5: Shredded cheese. Any variety of taco or mexican cheese, chihuahua cheese, cheddar cheese will work. Pick your favorite. Layer 6: Guacamole. Of course we make homemade guacamole to top our layered taco dip, but store bought guacamole will taste great too! Layer 7: The final layer is the garnishes. Lots of chopped up cilantro, some green onion, and the cherry tomatoes for the holly. Voila! If you hate cilantro (I know there are some of you out there), feel free to skip that and add in some shredded lettuce instead! Refrigerate until ready to serve (at least one hour). Remove the springform pan (you may need to use a knife to gently run around the edge). Remove the can from the center gently. Don’t remove the pan until you are ready to serve immediately. Serve this layered taco dip with some tortilla chips and enjoy! If you choose to not make the wreath, you could just add all the layers to the bottom of a deep dish pie plate or square baking dish. You could even use a large bowl or trifle bowl too! This layer dip makes a great game day snack, so be sure to save the quick and easy recipe for any time of year! 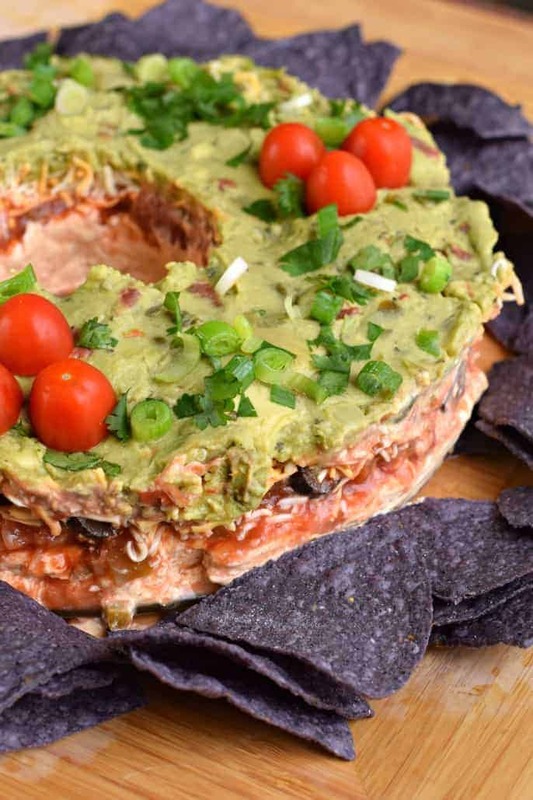 Get the recipe for The Best 7 Layer Dip (in a 13×9 dish)! If you’re hosting a fun Christmas Party, then you know the food is where everyone gathers. Don’t worry, you can make some stress free snacks that everyone will love, and YOU don’t have to work hard. 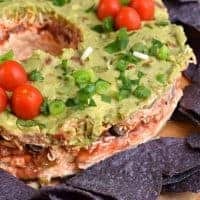 One of my favorite dips is the BLT Dip. Make the bacon the day before, so that you can assemble the dip before the party. It’s so good, and it’s loved by kids and adults! This Microwave Pepperoni Pizza Dip takes minutes to throw together, and minutes to heat in the microwave. Making it the perfect holiday snack. Don’t forget the drinks!Try this Cranberry Ginger Ale Punch that can be made boozy or not. It’s great for grown-ups and kids alike! Or how about Grinch Drinks? This one is fun and festive and NOT for children. Looking for more Christmas party ideas? Check out my Christmas archives. Or hop over to Pinterest and see all my recipes and more! 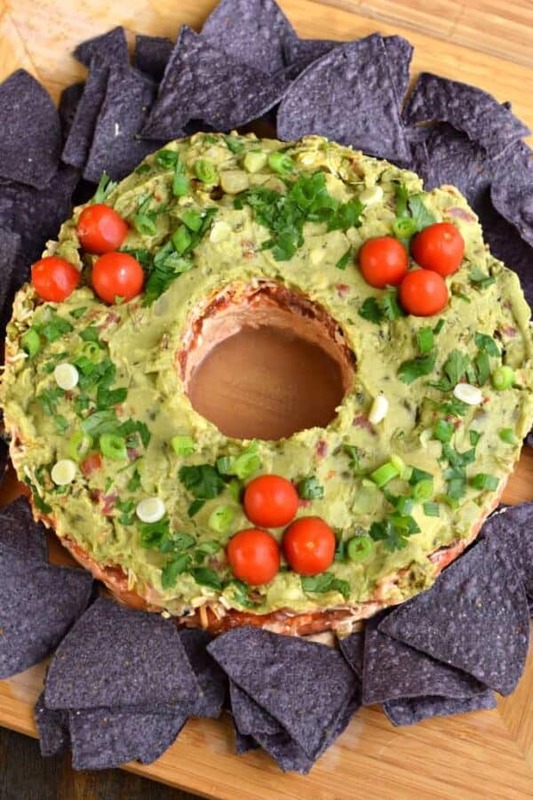 Festive holiday Wreath Layered Taco Dip recipe! Line a small glass or can with aluminum foil. Wrap tightly so no wrinkles. Place in the center or a 9 inch springform pan. In a medium bowl, blend cream cheese, sour cream, and taco seasoning until smooth. Spread in bottom of pan. Next layer the salsa, green chilies, and black olives. 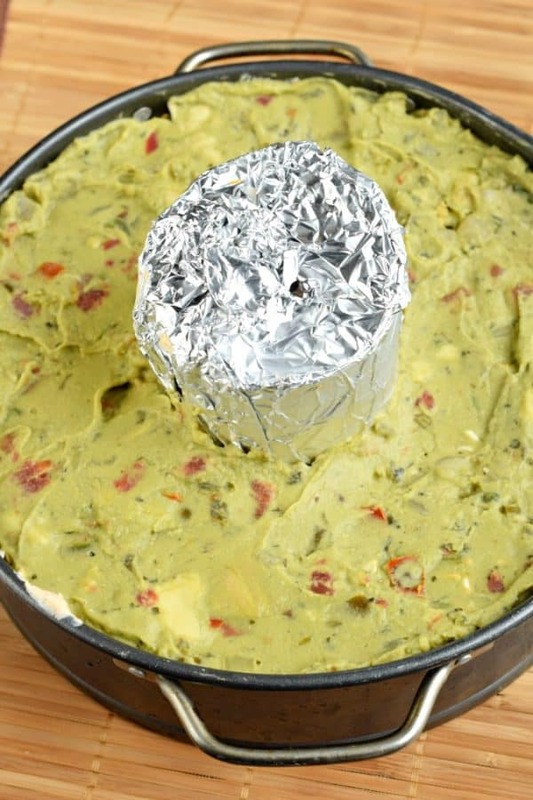 Top with shredded cheese, then spread guacamole over the top. To garnish, top with cilantro and green onion. Add cherry tomatoes for holly. Refrigerate at least one hour. Keep in pan until ready to serve. To serve, remove pan (using a knife around edges if needed). Remove can from center and serve with tortilla chips. ENJOY. 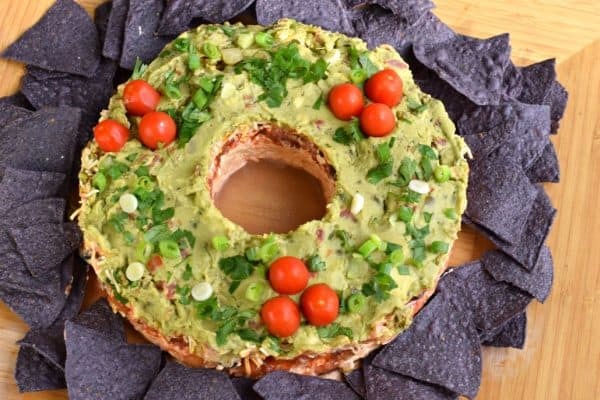 I love this festive wreath taco dip so much! It’s so easy to make and serves a crowd! It’s perfect for parties!! This was SO good! Perfect for holiday parties! This is such an fun and unexpected way to serve this dip! Love it! How fun is this dip! I bet it would start lots of conversations at any holiday party. Your springform pan hack is ingenious! And of course, the dip is totally delicious. I need an occasion to make it again! Love this idea! So fun and festive!